Our products are renowned for their world-class, most of them are used on major tournaments such as World & European Championships, Olympic Games, Pan-American Games, and others. Since many years we are supplying this world class products to Olympic committees, Federations, Schools, Universities, Dojos and studios worldwide. The following are just a few examples of the satisfied customers using our Mats...!!! Thank you very much for all of your help securing the mats for the tournament. It was very nice to meet you and get a chance to talk to you. I wish I had more time this weekend to talk with you more but as you could see I was doing my best to hang in there during the controlled chaos. The quality was fantastic and the color worked out perfect. You really came through for us. You are a very good representative for your company. I hope you were able to make some good contacts with some of the competitors and coaches. Again, Phillip and I are both very appreciative of your help and support of the Submission Sport Grappling Championships. We are planning on holding number II sometime in late Feb / early March. I would like to thank Champion Mats for their fine products. 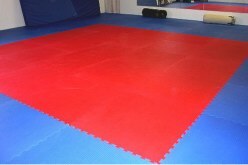 We have been using the blue judo puzzle mats (tatami), 1 5/8", for 2 years now. They are taken up after every class because we share the space, but are still as good as the day we bought them. The links are tight, the mats are perfect for rolling & throwing that we do in gung fu, and the adaptability provided is unsurpassed. We can configure the mats in any fashion we want, and that's a great advantage. 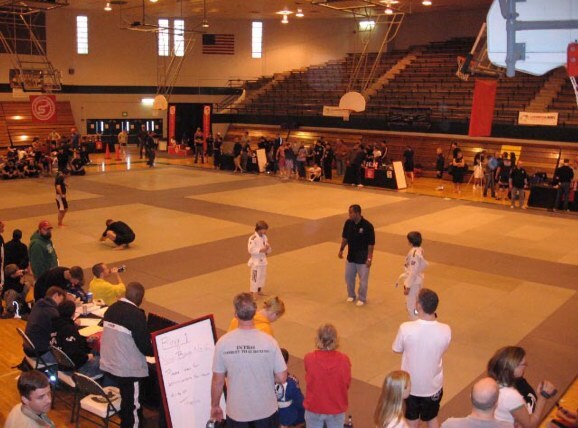 I've taught gung fu for over 30 years, and used judo tatami, wrestling mats, tumbling mats, carpeted floors and bare dirt as training surfaces. These puzzle mats are the most versatile, useful surface to train on I've experienced. No twisted ankles or broken toes getting tangled in the mat, no injuries from a "too hard" surface when landing. Thanks for a great product ! Pacific Air Forces, Kadena Air Base - Okinawa, Japan - Mr. Cliff W. Peluso. Kensei Martial Arts - Red Deer, AB Canada - Mr. Kent Brown. City of Los Banos, Police Department - Los Banos, CA 93635 - Mr. Preston Jelen. ATA Crete - Crete, IL 60417 - Sensei Mace Devries. Athletic Zone - Nogales, AZ 85621 - Mr. Miguel Ortega. Derrick Club - Edmonton, AB Canada - Mrs. Kathryn Francis. Al Lima's Studio of Self Defense - Hudson, NH 03051 - Sensei Al Lima. Prima Valley School, Fusion Martial Arts - Marietta, GA 30064 - Mrs. Shelley Hill. YMCA of Grater Grand Rapids - Grand Rapids, MI 49546 - Mrs. Amanda McGee. HF Sports - Venezuela, South America - Mr. Rafael Melo. Drake University - Des Moines, IA 50311 - Prof. Chip Miller. Nova Terra BJJ Club - Newton, MA 02460 - Mr. Jean Freitas. Sabin Skill Center, Law Enforcement Academy - Milwaukie, OR 97267 - Mrs. Melanie Brubaker. Indoor Playground Inc. - Lowell, MA 01851 - Mrs. Robin Insuik. LJV Sport, S.A. de C.V. - Monterrey, N.L. Mexico - Mrs. Noemi Trigo. Brazilian Jiu-jitsu Center - Ft. Lauderdale, FL 33062 - Mr. Pablo Popovitch. Judo & Self Defense Academy - Miami, FL 33175 - Mr. Roberto R. Del Cristo, M.D. Missouri State Hwy. Patrol, Law Enforcement Training Academy - Mr. Kirk Davis. UCLA University of California - Los Angeles, CA 951612 - Mr. Derrik Baker. Universidad Autónoma de Ciudad Juarez, Chihuahua - Mexico - Mr. Jaime Esparza. Arizona State University - Tempe, AZ 85287 - Mr. Jeff Bricker. Open Door Brazilian Jiu-jitsu - Oakland, CA 94601 - Sensei Mr. Sergio Silva. One Body Wellness Center - Rigdewood, NJ 07450 - Mr. Jay Lally. King Fahad University - Dhahram, Saudi Arabia 31261 - Mr. S. M. Kamran. 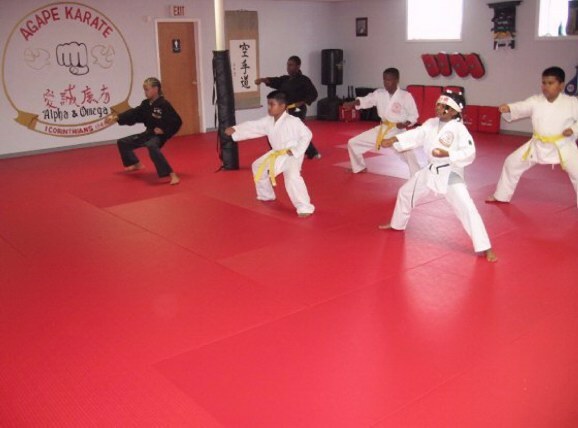 Callaway Martial Arts - Hialeah, FL 33016 - Mr. Felipe Francisco. AT Risk Protection & Investigation - Warrenton, VA 20187 - Mr. James Roncal. the floor mats we purchased from your company. Cano's Judo School - Reynosa, Tamaulipas Mexico - Sensei Gerardo Alvarez Cano. Boulder Police Department - Boulder, CO 80301 - Sgt. David Kicera. All Seasons Day Care - Bronx, NY 10466 - Mrs. Clara Longo. Jaguar of Tampa - Tampa, FL 33612 - Mrs. Robert Elder. Northwoods AKF Martial Arts - West Salem, WI 54669 - Mrs. Gayle Nielsen. Camp Ramah Judo - Lake Como, PA 18437 - Mr. Bruce Lipton. Temple of Full Autumn Moon - San Diego, CA 92111 - Mr. & Mrs. Phelps. Combat Ju-jitsu Center - Costa Mesa, CA 92626 - Mr. Don Leuschen. LakeShoreAikido.com - Holland, MI 49423 - Mr. Scott Nichols. Brooklyn Sport Club - Brooklyn, NY 11239 - Mrs. Debra. Klassen Martial Arts - Fenwick, Canada L0S 1C0 - Mr. Randall Klassen. Executive Self Defense - Keyport, NJ 07735 - Mr. Richard Kolman. Andrew's Dojo - East Greenwich, RI 02818 - Mr. Andrew Hordes. Martial Fitness - Miami, FL 33156 - Mr. Christopher Newton. Christ United Methodist Church - Bowling Green, KY 42104 - Mr. Matt Woodring. Victor Saona Judo Club - Guayaquil, Ecuador - Mr. Victor Saona. Niseido.org Ju jitsu Federation - Lake Worth, FL 33460 - Prof. Rick Riccardi.